The ABC uses photos of reef bleaching on Flowerpot Rock in American Samoa in stories about the Great Barrier Reef. The chairman of the Great Barrier Reef Marine Park Authority, Russell Reichelt says that activist groups are distorting surveys, maps and data to exaggerate the coral bleaching on the reef. The bleaching affects 22% of the reef and is mostly localized to the far northern section, which has good prospects of recovery. 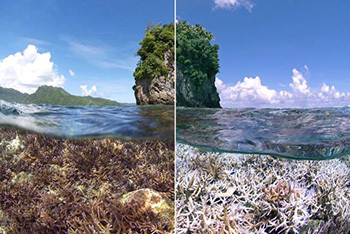 Two reef groups are in conflict. One is Reichelt’s GBR Authority, and the other is a special “National Coral Bleaching Taskforce” run by a guy called Terry Hughes. The Australian media was overrun with stories last week about how a report was censored to hide the damage. What was under-reported was the conflict and the propaganda. The real problem appears to be that yet another agency was set up to find a crisis, and their existence depends on finding one. The Taskforce was set up in October last year. ABC repeats all the Taskforce’s claims without question: “Great Barrier Reef: Only 7 per cent not bleached, survey finds”. Dr Reichelt said the authority had withdrawn from a joint ­announcement on coral bleaching with Professor Hughes this week “because we didn’t think it told the whole story”. The taskforce said mass bleaching had killed 35 per cent of corals on the northern and central Great Barrier Reef. The censored report apparently also said good things about Turnbull’s reef plan. Hard to believe the government would be in a rush to censor that. We have the largest coral reef structure in the world, but sometimes the ABC can’t find a picture of bleaching from it, instead using an image from Samoa (top right). Greenpeace used the same trick. The Courier Mail reported that the ABC and Greenpeace were caught, the ABC apologized, and replaced the photo on one of their many pages, but 7 months later, the unlabelled Samoan image still appears on stories about Barrier Reef bleaching and on stories of mass coral bleaching. Looks like a billion dollars isn’t enough to pay for someone to do a 2 minute search at the ABC. Fact checking? Who cares? The world was hotter during the Holocene optimum, yet somehow the Great Barrier Reef survived. Bob Halstead, a veteran Coral Sea diver and member of the international scuba hall of fame alongside Jacques Cousteau and Sylvia Earle, says up to 90 per cent of corals on the iconic Ribbon Reefs show signs of stress. But he is still confident of a quick recovery. “This may be the worst bleaching in Great Barrier Reef history, but I have seen far worse in PNG, and recovery in a few years,” he says. “So this is rather like the fires that ‘devastate’ and ‘destroy’ forests which then happily regenerate and no more is heard about it,” Halstead says. “If someone has not seen these effects before, the ‘bleaching’ is very dramatic, however I have seen this before, and I am not nearly as alarmed as I used to be. “The problem with all the ‘disaster’ hyperbole is that yet again the Great Barrier Reef will get world publicity reinforcing the idea that it is dead and not worth visiting. From comments on The Australian. I find it interesting that The Head of GBRMPA has said that Prof Terry Hughes organisation was “misleading” the public. I recently made a similar comment of Prof Hughes organisation (COE Coral Reef Studies at JCU) about a related issue – they stated that there was no coral on a particular reef and I furnished photographic evidence that this was incorrect. I stated that the information from Hughes organisation was “misleading” among other things including that there is clearly a need for some better quality assurance of the science. For my sins, I was hit with an academic misconduct charge from JCU, found guilty, and duly threatened with dismissal if I transgressed again. I am still bewildered by what happened. And this is only the tip of the iceberg as far as exaggeration of threats to the GBR is concerned.